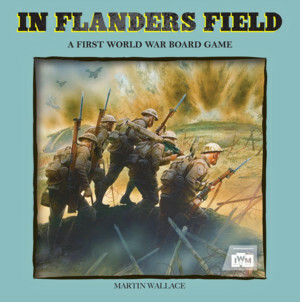 In Flanders Field takes the player to the very heart of what it would have been like to be a CO in the trenches of Flanders. At every move you must make decisions that will determine the fate of the men you command. Your troops must face bombardment from the enemy's artillery, tanks and aeroplanes. How many men will you risk on a particular course of action? A game for 2-4 players where you take a role as a British Company Commander attempting to be the first to reach the "Objective Line". You start from your own trench and must advance across "No Man's Land" while trying to limit your casualties. It's a "push your luck" game where you roll dice and play cards matching the roll, after which you can decide to try to advance further, or stop and carry out card actions. Pushing too far could incur heavy losses.